See how we saved ourselves some trouble by installing New Relic, capitalizing on it's free tier for server monitoring. Purely due to random circumstances at work (and on the side), I hadn't used New Relic in quite some time (~3 years). Recently I took another look and found that their Server monitoring tier was separated from their other offerings - APM, Insights, Mobile, Browser and others. This isn't how I remembered it, but perhaps the distinction was just in the messaging/marketing. In any case, the exciting part is that the Server monitoring tier is free! While in terms of your web application, you'll get the most value out of New Relic with their paid offerings, I've found the free Server monitoring to still be an instant life saver, especially when monitoring many (70+) servers. The free server monitoring tier is a lead-in to make it easier on your to decide to buy into the paid products, of course. Whether or not that stays free remains to be seen! At work, we run customer trials and paid hosting through AWS. Since the main application is an on-premise application (and not the typical multi-tenant code/database structure), we have a server per application instance. That makes for a lot of running servers! We've setup Cloudwatch with SNS for alarms and notifications, but it's still hard to use Cloudwatch to get a good overview of all the servers. 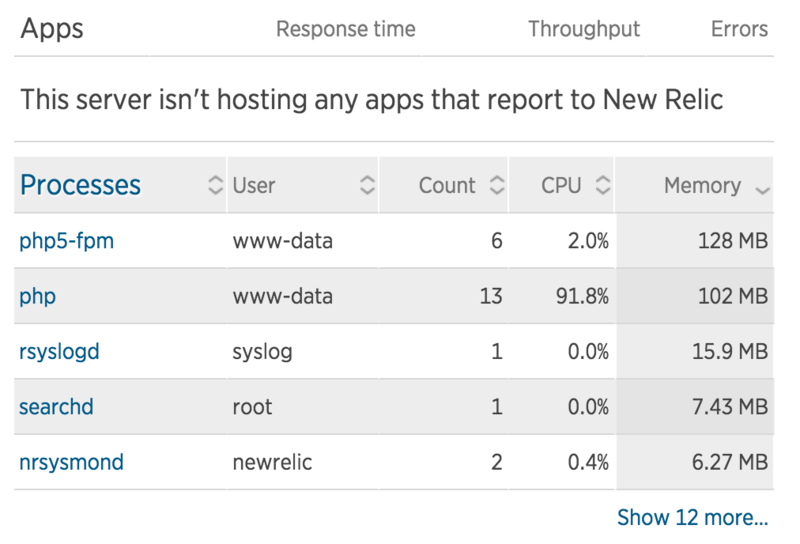 We decided to try out New Relic on a subset of the servers to see what insights we could find. We were immediately happy that we did. Installing the server monitoring daemon is really easy, particularly because they hand you OS-specific instructions on a silver platter when you choose to add a new server within their web console. Their instructions will conveniently give you your license key. Don't blindly copy and paste the license key above ?. You technically don't need any more configuration, but I do like to change one more thing. The server name as shown in New Relic will match the server's host name, which you can find by running the command hostname. This might not be the way you want to identify it, so you can either wait for the server to appear in New Relic, or configure the hostname ahead of time in the New Relic configuration installed on your server. I choose the latter approach. Edit the /etc/newrelic/nrsysmond.cfg file and change the hostname section to whatever is appropriate for your server. You'll soon see that server appear in your New Relic account under the Server section, without any further work on your part. Note that PHP is a bit out of control there - that was one thing that we were alerted to, as the server has a high CPU usage over their default threshold of 15 minutes. We found some zombie PHP processes, which we killed off quickly. We immediately saw CPU reduction back to normal levels. 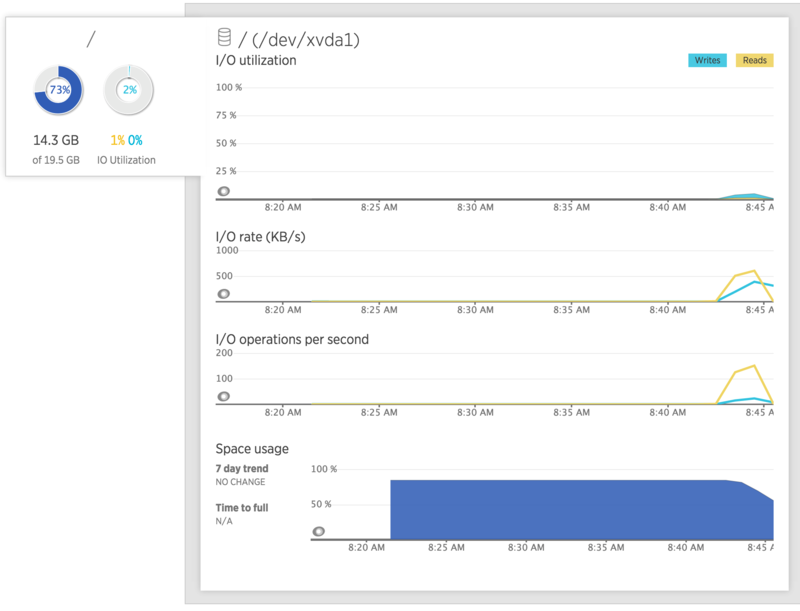 New Relic also gave us alerts about disk usage. One server had excess files taking up a lot of space. We were able to reduce the disk spaced used by manually deleting extra media files, giving us time to provision more hard drive space. Alerts may not send you alerts off the bat, but can be easily configured. In any case, when viewing a list of all your servers, you will see some on the sidebar worth paying attention to. #          required in order for the server monitor to start. #          names generated by Docker containers). When using Ansible for this, I actually provided the domain variable has a host variable, included in the hosts inventory file for each host being updated.